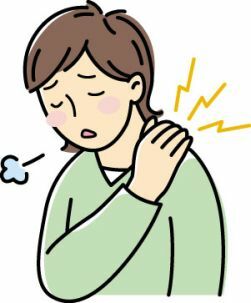 Are you experiencing stiffness or pain around your neck, back, and arms, and massages and plasters cannot relieve your pain at all? That's because it's not a simple stiffness that you think. Even if you place hundreds of plasters or ask your massage expert, and even if you place a hot compress on your shoulder, you will have no satisfactory result at all. Applying hot compress, plasters, or massage, should eliminate and relieve 'common' stiff shoulders and simple pains. If not, then you might have “Chronic Gouty Arthritis”. In chronic gouty arthritis, the place where you feel pain is not the area that has to be treated. It's a common mistake to assume that the problem is at the place that hurts! This symptom is commonly known as “referred pain”. Referred pain is defined as pain that is felt not at its source but in another part of the body. More importantly, identifying which part of the body is causing the pain can be very tricky. If you're suffering from this condition, it is advisable to visit your physician or shiatsu (acupressure) therapist. Shiatsu therapists can locate the area of the body causing the pain by means of “acupressure”. The source of pain is called the “trigger point”. Now you may ask why the trigger point and the area of pain are in different location of the body. That's a good question. If we stay in a position or attitude for a long period of time, the blood circulation will deteriorate and the surrounding muscles will be affected. Such condition will create stiffness. This stiffness or pain can be eradicated easily by massage or applying hot compress. When the pain is chronic, you can suspect it as chronic gouty arthritis. But how those simple pains happened to become chronic gouty arthritis? Continuous signals or signs of pain sent to your brain will significantly increase, and your brain will memorize it as real pain. The brain will register the designated part of the muscle as PAIN and becomes a trigger point. That's how trigger point is created. If the pain continuously stimulates the area, the area will have a tendency to expand and increases the trigger point. Then, you will feel pains all over the body for the whole day. It is really a pain created by the brain due to misinformation, just like an illusion out of wrong information and incorrect memory of the brain. If the trigger points are left untreated, the muscle surrounding it may harden and even the bones will be deformed. There are cases where the arms cannot move at all. In fact, all the pain is just an illusion. If treatment is neglected, it will create trigger points. It is very important to consult your physician for diagnosis before it gets worse. The illustration below shows the acupressure points. The attending physician will strongly press the points with their finger. If you feel pain somewhere in your body when a certain point is pressed, then you've found the trigger point. On the trigger points, you can ask your physician to use anesthetic injection to reduce the stressed muscle and remove pains. This simple anesthetic injection will make the blood circulation smoother. Once the blood circulation is improved, the treated area will naturally get well, and will eventually heal. Is it so easy and simple? Yes, it is, when you know it. Of course, there are times that one anesthetic injection is not enough to yield satisfactory result. Some patients may need one injection every week for about 3-4 weeks. Another way of treatment is acupuncture (treatment with needles). Acupuncture has more than 4,000 years of history. 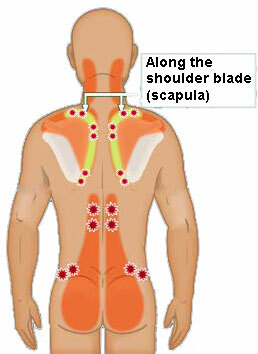 There are patients who suffer from pains on the waist area, and the trigger points were under the arms. Slow moving exercise like Tai Chi and acupuncture will help prevent chronic gouty arthritis. Good luck!